4th Assault Amphibian Battalion is a mechanized battalion of the United States Marine Corps reserve. Their primary weapon system is the Amphibious Assault Vehicle and they are part of the 4th Marine Division and the Marine Forces Reserve. The unit is based out of the Tampa Bay, Florida with subordinate units in Virginia, Mississippi and Texas. To land the surface assault elements of the landing force and their equipment in a single lift from assault shipping during amphibious operations to inland objectives. To conduct mechanized operations and related combat support in subsequent operations ashore. Activated on August 19, 1943 at Camp Pendleton, California, as the 4th Amphibian Tractor Battalion, Division Special Troops, 4th Marine Division, Fleet Marine Force. Reassigned during January 1944 to Corps Troops, Amphibious Corps, and deployed to the Pacific area. Redesignated on September 8, 1944 as the 4th Amphibian Tractor Battalion, Fleet Marine Force, Pacific Troops, 3rd Amphibious Corps. Detached on November 11, 1944 from the 3rd Amphibious Corps. Redesignated on July 15, 1945 as the 4th Amphibian Tractor Battalion, 2nd Amphibian Tractor Group (Provisional), Fleet Marine Force, Pacific, and deployed to Guam, Marianas Islands. Redesignated on September 30, 1945 as the 4th Amphibian Tractor Battalion, Fleet Marine Force, Pacific. Redeployed during October 1945 to Camp Pendleton, California and deactivated on November 26, 1945. Participated in training exercises throughout the 1970s and 1980s. Participated in southwest Asia, Desert Shield, and Desert Storm as augmentation force to sister Assault Amphibian Battalions. 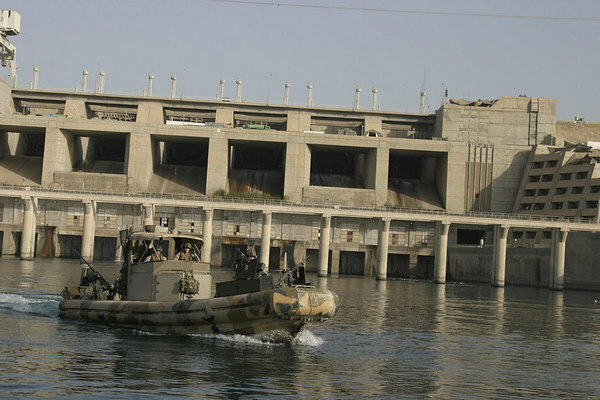 Marines from Dam Security Unit, Bravo Company, 4th Assault Amphibian Battalion patrol near Haditha Dam in 2006. 4th AABn have provided augmentation to its sister Assault Amphibian Battalions during Operation Iraqi Freedom and Operation Enduring Freedom. These battalions were in the 1st Marine Division and 3rd Marine Division. 4th AABn was activated in January 2003, and deployed to the Middle East in February 2003. On March 18, 2003 - hours after President George W. Bush's speech and aerial attacks on the country, all convoys were staged to push to Baghdad. Weeks later, Bravo Company (-) reservists were the first of the battalion to set foot in Baghdad. Although destroyed bridges were an obstacle to many units, B Co(-) ability to cross the major rivers was an integral part of the overall mission. 4th AABn has deployed company sized elements in support of Joint Task Force-Horn of Africa. In the wake of Hurricane Katrina, elements of 4th AABn were deployed to the Gulf Coast in support of rescue and recovery operations. Alpha Company, 4th Assault Amphibian Battalion, was deployed to Iraq in 2008 to support Regimental Combat Team 5. There they conducted provisional infantry missions as Helo Quick Reaction Force and other infantry operations throughout the Al Anbar Providence. Bravo Company, 4th Assault Amphibian Battalion, was deployed in 2009 to Al Asad, Iraq, attached to 1st Battalion 8th Marines.